So, like, are you totally ready to step back into the 80s and have a bodacious time? 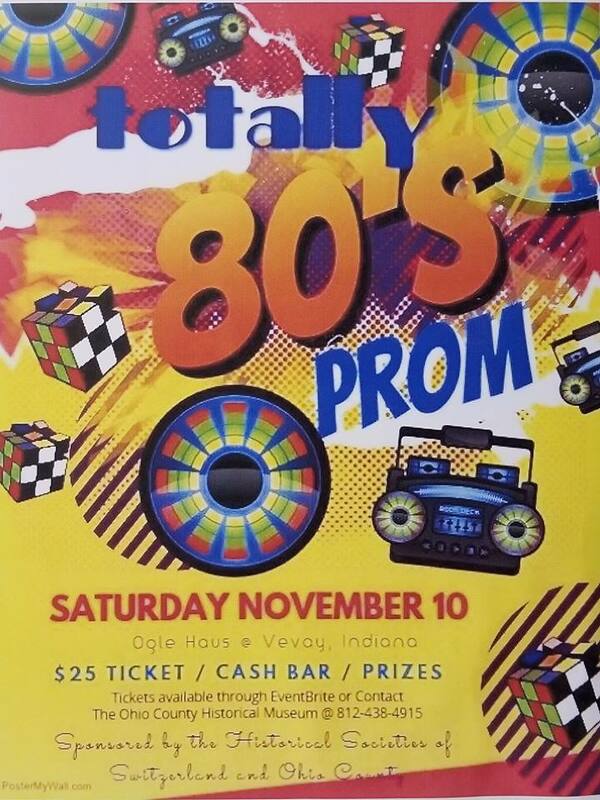 Pull out that old prom dress, get a tux, and come join us at the Ogle Haus in Vevay as we help the Ohio County Historical Society celebrate the 50 year anniversary! King & Queen ~ you vote, plenty of dancing, raffles, 80’s video games, euchre tournament, nacho bar & snacks, cash bar! Get your tickets now ($25.00 per person) for this combined fundraising project of the Switzerland County Historical Society and the Ohio County Historical Society! Contact the Switzerland County Historical Society or the Ohio County Historical Museum for tickets. See you at the Ogle Haus on Saturday, November 10th, for 7:00 until 11:30 pm.